A visit to Camp Nou is a must-see for many students. 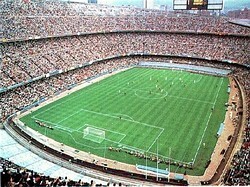 It is the largest football stadium in Europe, home of Barcelona Football Club ('Barça' as it is known locally). Its not just the size of this stadium that makes it so impressive, but also the amount of sporting facilities around it. It houses a large museum showing off all of Barcelona FC's trophies and all the other Barcelona club trophies such as basketball. Tours of the stadium take about an hour and include the changing rooms, the tunnel and its chapel, the managers' dug-outs and the trophy room. Visits for groups of 20 or more should be prebooked.